It's funny, when I take a break from my blog I feel the need to offer apologies, spilling excuses — it's warm out, so much traveling to do, I've been so busy — but now I'm stopping myself as I remember that this blog, a tiny online space for self-expression, is a place to be free. It's so easy to get caught up in the numbers, your followers, what is your brand, what do people want to see, what is the most professional, but when I remember the humble beginnings of this space — simply a place to share my photos and adventures with my friends and family — I think: W h o C a r e s.
And I feel I've been catching myself in this trap a lot these days, with the ending of my baking training I've become more and more attached to external obligations, what life course will make my family and peers most happy, what is the correct image to present to the world, how will I fully support myself, until these are the only thoughts I'm having, and I can't remember what I really want anymore. But these thoughts prevent you from fully living it, doing it right, following that inner drive, all that stuff. So, no more of that. It's always the right time to line beliefs back up with actions, get present, have a bit of gratitude, and figure out what you need to do to be happy where you are. Sometimes that takes a bit of work, but it's all possible. 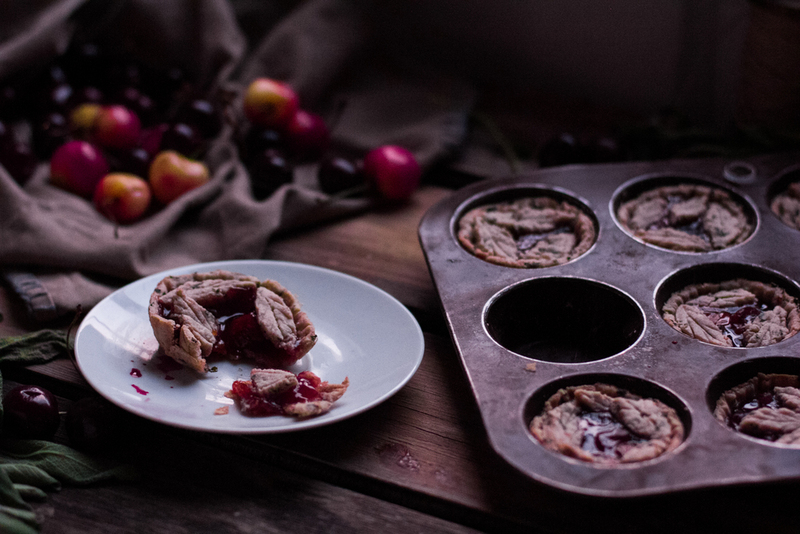 So, returning to a bit of humility and cute, I made these little cherry nectarine pies made in muffin tins! And they're all wrapped up in a sage spelt crust, made with coconut oil! And to make it perfectly me-ish I cut out little leaves for the top. I. Place flour, salt, and sage together in a bowl, stir to combine. Cut coconut oil in by hand. Add ice water in a couple of tablespoons at a time and mix with a fork until the dough just begins to come together. II. Turn dough out onto a cutting board and flatten into a disc. Wrap with plastic wrap and refrigerate at least an hour or overnight. I. 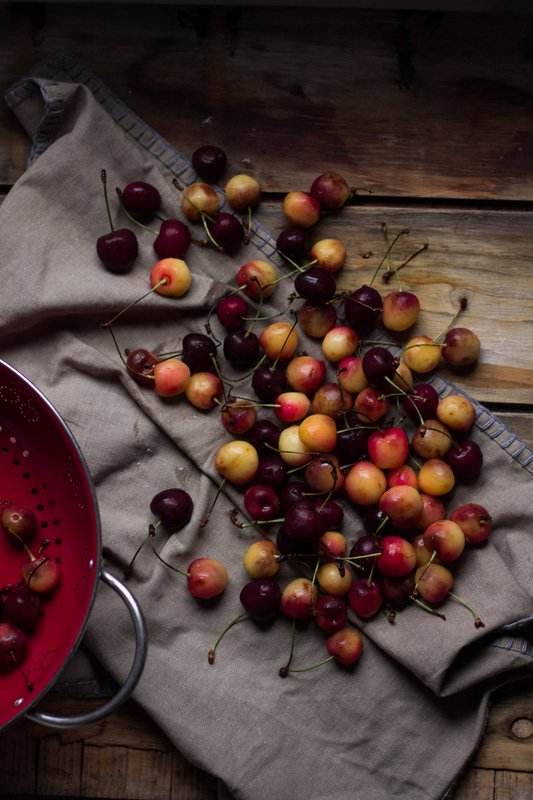 In a saucepan, over medium heat, combine cherries, nectarines, water, lemon juice, sugar, honey and cornstarch. Bring all to a boil and then reduce heat to low and cook, stirring often, for about 15 minutes. Allow to cool. I. Preheat your oven to 350 degrees. On a lightly floured surface, roll out your pie dough. Using a large circular cutter (I used a large mason jar lid...) cut out 12 circles from the dough. 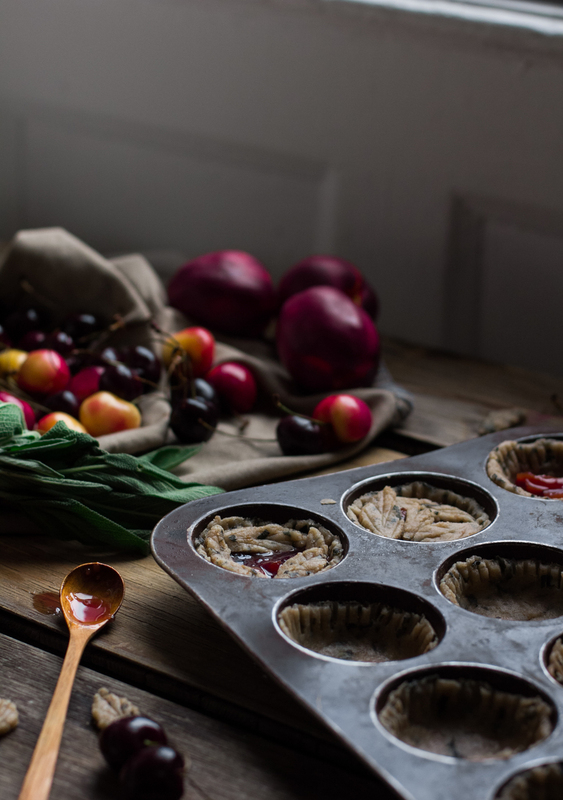 Place in a lightly greased muffin tin and press it into the shape, using a fork around the upper, outer edges. II. Roll out the remainder of the dough, and using a paring knife, cut leafs of varying sizes, around 64, but really you can do as many as you'd like. III. 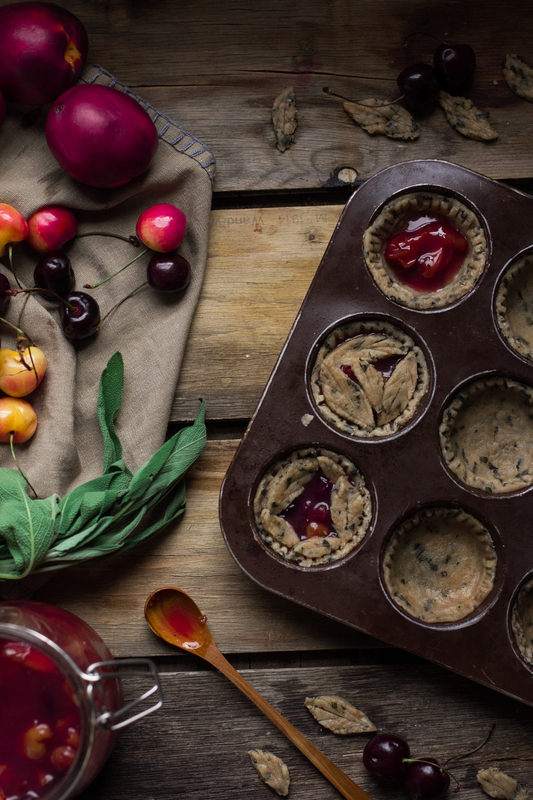 Scoop 1-2 tablespoons of cherry filling into each pie shell, then place your leaves on top in whatever arrangement you'd like! IV. Bake for 30 minutes, and if you can allow to cool before eating!